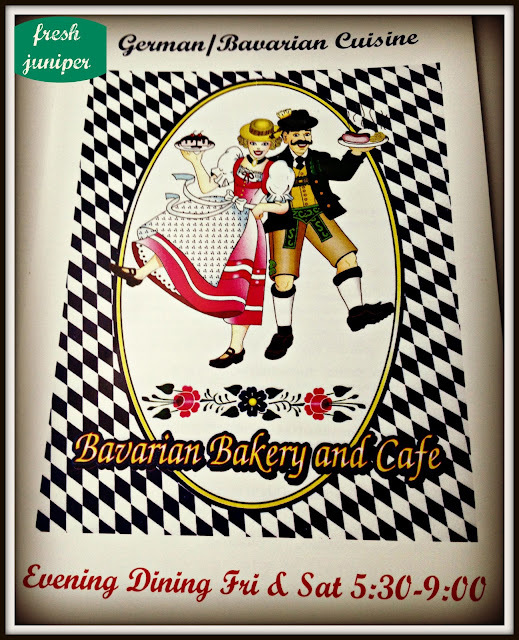 Welcome to the Bavarian Bakery. Entering this bakery is like leaving Texas behind and traveling back in time. Despite the industrial feel of the building's exterior and location, this establishment is full of old world charm and flavor that you notice as soon as you walk in the door. I started coming here almost 20 years ago. It was one of the little discoveries I made when my workplace was temporarily relocated in the same industrial complex. Otherwise, I might have never even heard about it. 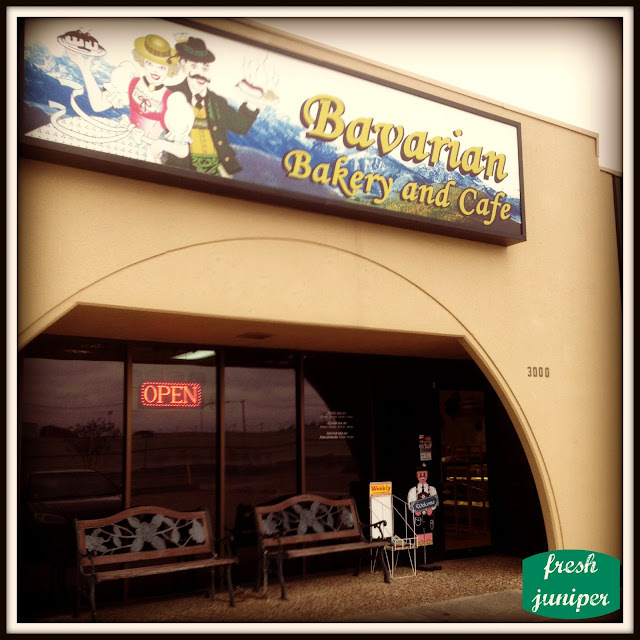 The Bavarian Bakery is located in the Southeast Loop 820 Business Park. It is roughly between Sam's Club and Whataburger on the south side of 820. Almost directly across the street on the north side of 820 is the Tarrant County College South Campus. 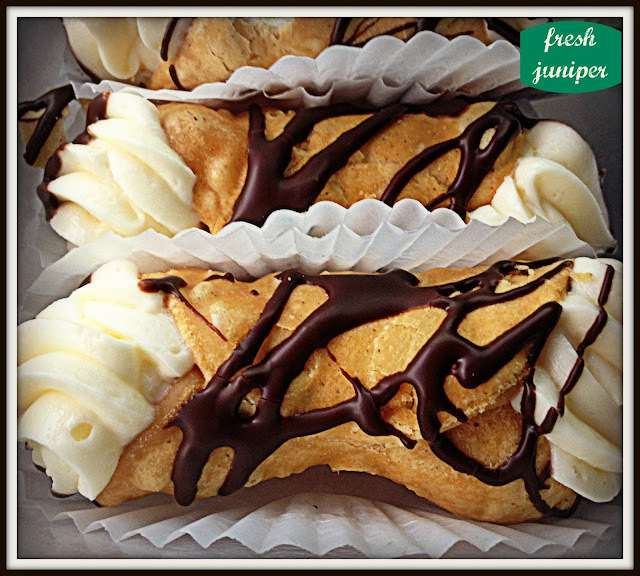 Mini Cannolis - my favorite! If you look up Bavarian Bakery and Cafe on google, you may be underwhelmed. It is not a franchise with a slick online menu or delivery service. Until very recently, every time I came in there were some sweet little ladies with fairly thick German accents that took my orders. I think they were the former proprietors. Want to know what to order when you come in? Just order anything. Order everything. Absolutely every bit of food I've tasted here is delicious. 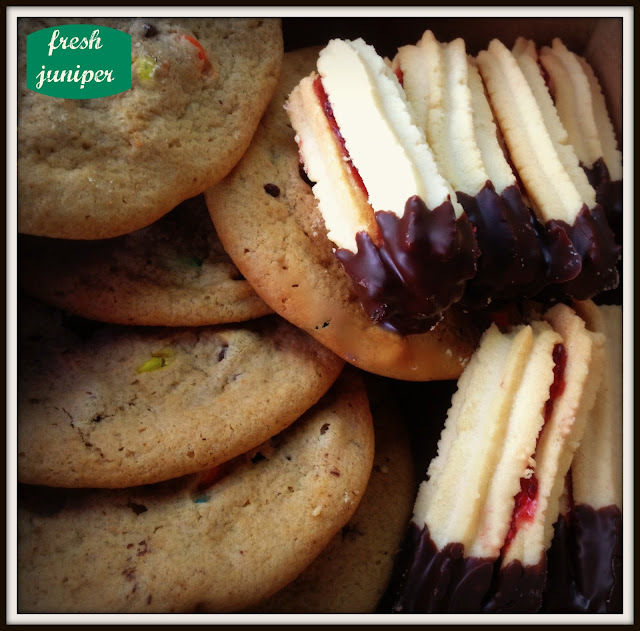 On this particular trip, I decided to get some cookies in a to-go box for the grandkids. I couldn't decide if they'd like chocolate with raspberry jelly filling or chocolate chip with m&m's the best, so I got both kinds! The stunning Black Forest Cuckoo Clock is by far the most breathtaking cuckoo clock you'll ever see. It is so large they had to open up the ceiling and add a skylight to hold it! 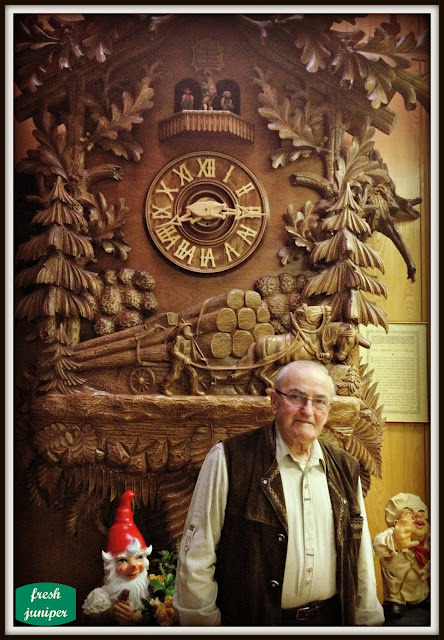 German proprietor of Bavarian Bakery in traditional attire with stunning Black Forest Cuckoo Clock and little gnomes. I love the traditional German attire this gentleman is wearing. 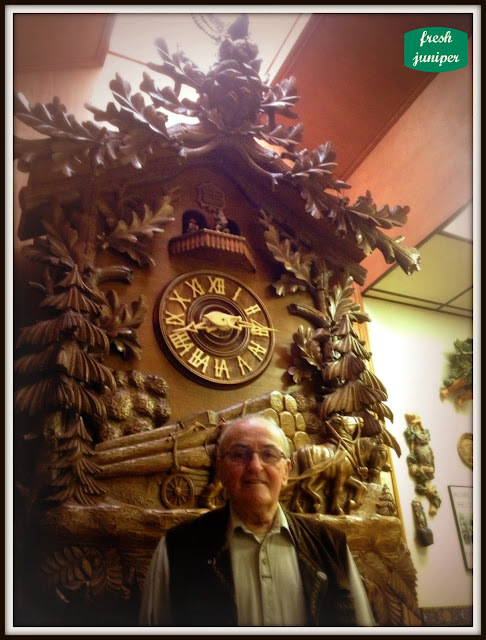 He is just part of the overall ambiance of the bakery. Remember they serve lunch and dinner! Okay a proper restaurant and bakery review would show you some of the actual food items on the lunch and dinner menus. I can only visit early in the morning before the restaurant serves lunch. Trust me. The lunches and dinners are very tasty, too. The Coffee Cake with Raspberry Filling is divine. 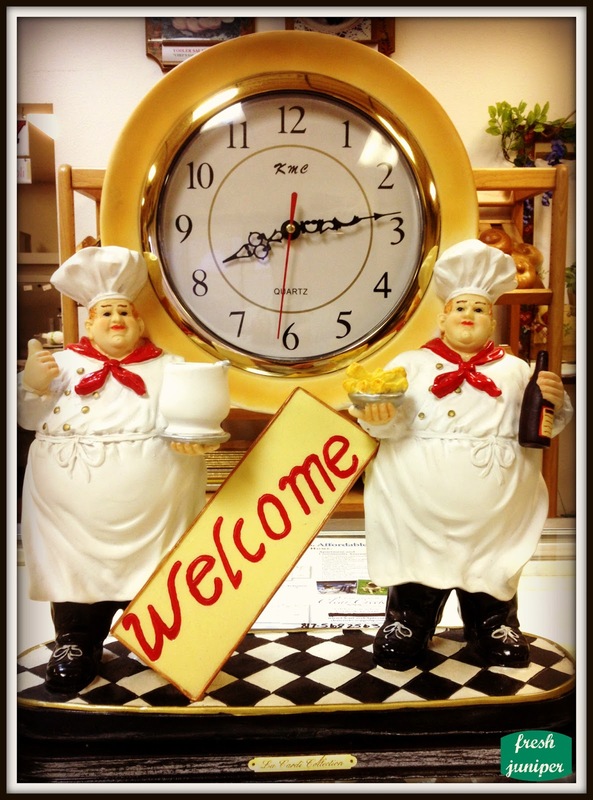 This is also a wonderful place to order cakes for special celebrations. You can see a little bit of one of the wedding cakes in the corner of this photo next to the small Black Forest Cuckoo clock. 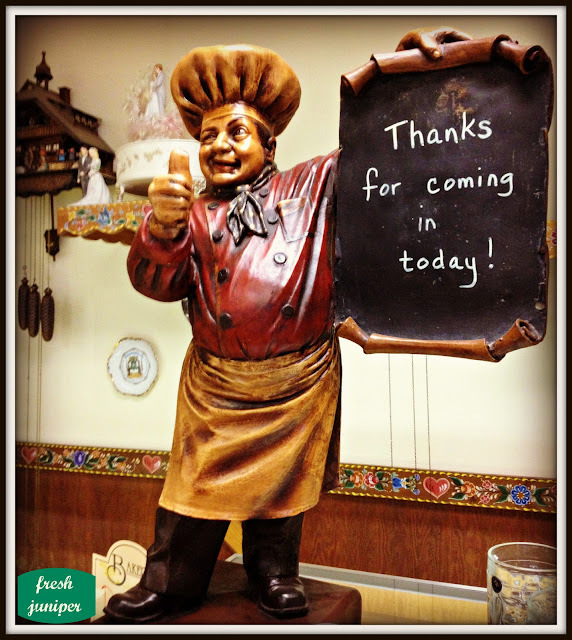 Charming Baker Statuette - Thanks for coming in today! You see, the outside of this place is just a box. With the exception of the charming sign and the benches, nothing about the exterior is particularly inviting. As you see, looks can be deceiving. The cold exterior masks the warmth and charm found inside. Little did I know when capturing these photographs, they'd be some of the last ones made of this place before it was sold. 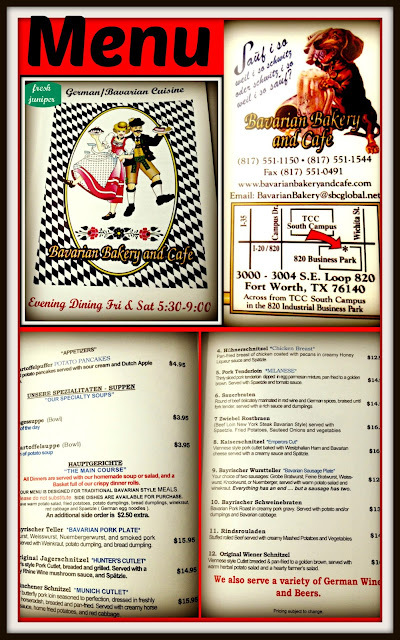 Today it is still the Bavarian Bakery, but you won't get the sweet little German ladies and gentlemen to come to the counter and take your order. The food is still good. The new owner is friendly. 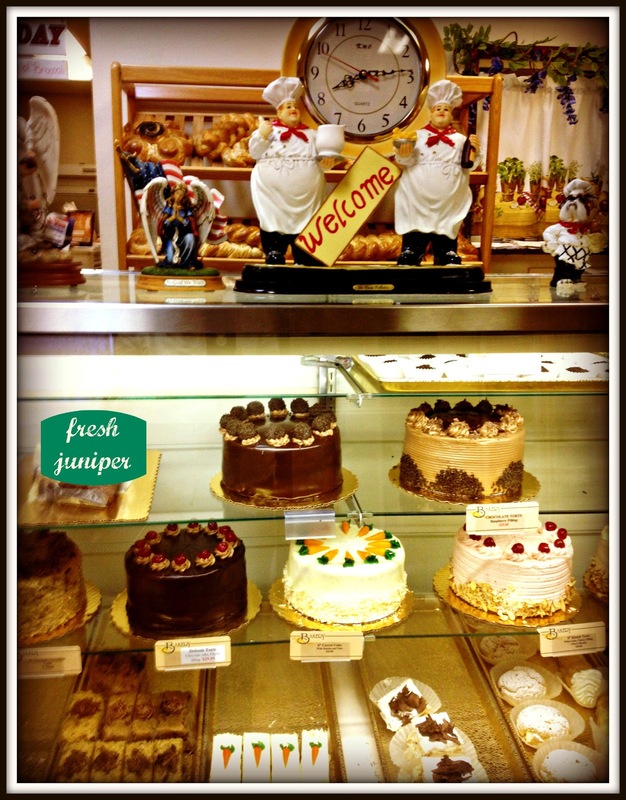 He assured me that when he bought the bakery, he also bought all the recipes on the menu. It still has the beautiful clock, too. All the physical charm still exists inside the place. As much as I'll miss the German proprietors, I welcome the new owner. I'm so glad this place did not close forever. When I met the new owner I bought some of his mini cannolis. 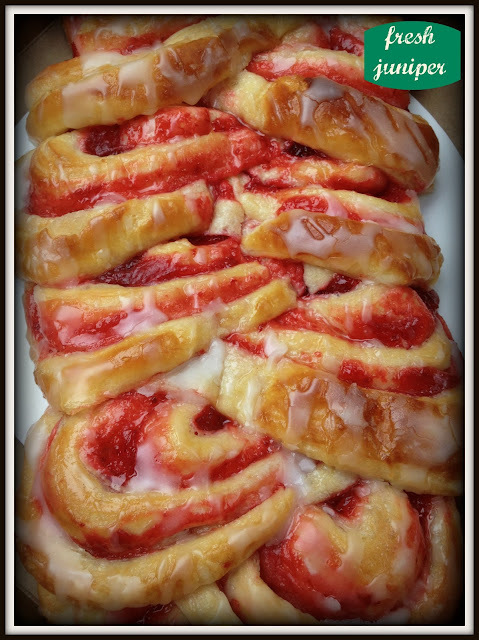 They are STILL my favorite tiny little sweet treat in the bakery case.